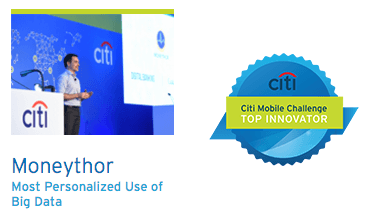 Moneythor, a financial technology company providing banks with a modern toolkit to enhance their digital banking value proposition, was named a winner in Citi Mobile Challenge Asia Pacific as the “Most Personalized Use of Big Data”. Citi Mobile Challenge is a next-generation accelerator of Citi, the leading global bank, that combines a virtual hackathon with an incubator, a worldwide network of FinTech experts and Citi’s unparalleled global sponsors and clients to discover solutions across more than 100 markets. “Citi Mobile Challenge Asia Pacific was by far our biggest and most competitive program yet. The solutions we saw at Demo Days in Bengaluru, Singapore, Sydney and Hong Kong were outstanding, and the top innovations from this Challenge are of the highest quality. Congratulations to our award recipients and we look forward to collaborating with you!” said Jorge Ruiz, Global Head of Digital Acceleration at Citi. Teams from 15 countries presented 72 working prototypes to Citi executives and technology influencers. When entries were evaluated on impact, viability, user experience and functionality, the Moneythor solution was praised for its intelligent use of data to boost digital engagement for the bank’s customers. In addition to the prestigious award from Citi, Moneythor also won a Sponsor award from Allianz Worldwide Partners selecting the Moneythor solution as a top innovation of the competition. More details on the Citi Mobile Challenge Asia Pacific results can be found in the press release from Citi.